What changes would occur if we, as a human species, all around our globe, actually woke to the reality that we are truly One eco-system? We are interwoven, interconnected, and not separate from one another. This is not a “woo-woo” New Age thought. It is not a hypothesis. It is reality. A species doesn’t vanish from the earth without the whole system shifting in some way. Each year between 200 to 2,000 species leave the earth forever every 360 days. Scientists estimate that 150 to 200 species of plant, insect, bird and mammal become extinct every 24 hours. The Earth is losing animal species at 1,000 to 10,000 times the natural rate — greater than anything the world has experienced since the extinction of the dinosaurs nearly 65m years ago. Life in our seas — from coral reefs to fish — are in a extinction process at a mind-blowing rapid speed. Whether this is a result of suffocation from plastics or from diseases caused by highly toxic materials being dumped into our seas, the overfishing, the habitat loss, and the oil spills from drilling, the fact is that life is leaving us. 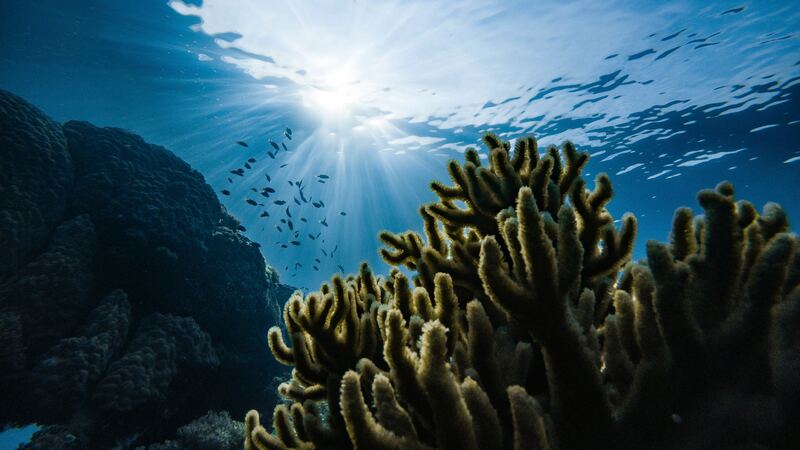 Scientists are stating that by 2048 the fish and coral will be extinguished in our oceans. No more. Gone. Human beings who live by the sea and depend on the ocean as their main resource for livelihood and survival already know the magnitude of the impact of climate change. We are in an emergency state for real — way beyond the dangers at the Mexican border, our Earth is in crisis. But instead of mobilizing in a urgently appropriate response, we are currently speeding up the process of extinction by revoking the laws we previously had in place that slowed down the destruction and gave some level of protection. The bizarre thing is that we know all of this. We know it in our guts. We appear to not care… enough. As a psychotherapist, I have wondered how humans are not more alarmed and moving into radical action? Is it that our defense mechanisms of denial are so strong in response to a threat to our survival that we can’t face it and we will just go on pretending it’s “business as usual” until one day, we just can’t. Or, is it that people in power appear to have endless greed and lust for more money and power that they must try to cast a spell of doubt and disbelief that climate change is real? Maybe it’s that we, as a society, are so addicted to the need for immediate gratification that we just don’t want to be inconvenienced and have to sacrifice our comforts. And humans resist change, so why not support the people in power who don’t confront — and make us confront — the crisis that we are in. Who do we choose to make and repeal laws that lead to either more destruction or reconstruction? What can actually be keeping us in this much of a trance and delusion that we, as a civilization, are not acting sane in response to the global disaster that we are actually already in? Our houses are burning down by out-of-control fires. We are running out of water. Our locales are declared to be without safe water to drink. We evacuate our homes because hurricanes and tornadoes are some of the worse we have ever seen, and afterwards finding our neighborhoods looking like war-zones. It’s the only thing that matters because if we don’t have an inhabitable body, we do not exist. When we delude ourselves to believe we are separate, we operate as competitors and we accelerate our destruction. When we align with reality that we are one, we naturally cooperate, unite and harmonize. We cannot expect our egos and conditioned minds to truly understand the enormity of all of us being one eco-system. Yet, if we acknowledge the validity of science and invest in its merit, we can break through denial in order to address the reality that everything is interdependent, forming a synergistic and self- regulating, complex system that maintains and perpetuates life in all its various forms living on this planet. If we dare to truly pay attention, we would hear the alarm and for survival sake, we would graduate from child-like thinking to big awareness strategies. We would naturally make choices in alignment with being on the same team — the only team. The team that is about survival and sustaining. The paradigm shift is that reverence for all beings (respect, harmony and cooperation) are essential for survival and thriving. This is another step in our practicing the goodness breath. Let’s practice awareness that the air we breathe is one with the air that all beings are also breathing. All plant and animal life engage in a respiration process occurring on a cellular level, involving an exchange of oxygen and carbon dioxide. Bottom line, all sentient beings are breathing. We inhale and exhale into awareness of our Oneness. This leads to a natural evolution as we look closely at our own choices in our lives and re-align them to demonstrate awareness of our one eco-system. Along with this consciousness comes the clear necessity to have only representatives in our government who understand the danger we are in and are determined to powerfully step up one-hundred percent to our global urgency. What else matters this much? What else is there really? Bring your own reusable shopping and produce bags to markets, and avoid using single-use plastic bags. Bring your own reusable coffee cup when going out to get beverages. Instead of buying water in plastic bottles, invest in a water filter and reusable water bottle(s). Bonus: it’s cheaper in the long run. Bring a reusable container to a restaurant with you when you expect to have leftovers. Refuse straws: It’s as simple as adding, “No straw, please” when requesting beverages at restaurants or cafes. Pick up trash in your neighborhood and when visiting parks and beaches. Deva Joy Gouss, LCSW, is a psychotherapist in private practice in Atlanta Georgia for over thirty years. She and her husband give weekend couple retreat workshops called Nurturing Your Love. She also facilitates many other kinds of trainings and workshops including Council of All Beings, Tribe Time, Marrying Yourself, Yoga and Movement Celebration to name a few. She is author of Re-arranged, Never the same: The Nature of Grief and Toolbox of Hope, For When Your Body Doesn’t Feel Good. Visit Deva Joy at www.healingheartcommunications.com.